The vivid imagination of Rehmannia Dean Thomas is blended with his passion for creating a better world in his futuristic depiction of life on earth in his book, "The Hsien". Fabricated as fiction, his imagery paints the wild truth of our society and several issues creating dissonance in our world. Full of history and facts embedded throughout the story, I often found myself on the edge of my thoughts wondering what was next and how else my mind could be expanded through the message. I'm very pleased with the read, as I always enjoy a creative story and I'm especially grateful for the affirmations of a new world perspective. If you believe that you were sent here to help heal this world, "The Hsien" is a wonderful collection of words that will not only reinforce your desire to be a catalyst for change but it will give you the thrill you're seeking in a short read! I just wanted to let your company know that I enjoy purchasing your products that I can actually use. Your company is doing a awesome job and I just wanted to let you guys know. "When I first moved to Los Angeles in 2007, I had been a raw foodist for quite some time. However, my body felt really out of balance and I didn't know why. When I met Rehmannia, he quickly helped to bring my body back to homeostasis and get more chi flowing to my damp spleen. He was the first person who showed me that vegan food and Traditional Chinese Medicine were not only compatible, but gloriously effective in achieving optimal health together. Through the years, his brilliant formulas have come through for me time and again. I'm a huge fan of making homemade tonics with the Morning Jing formula and, let me tell you, your pesto will never be the same after you try the delicious Sea Clear. Shaman Shack makes some of the finest, most potent and medicinal plant-based products I've yet tried. They are delicious, versatile healing foods crafted with mindfulness and mastery." -Jason Wrobel, Celebrity Vegan Chef and author of "Eaternity"
I hope this note finds you surrounded by love and light. I met you at the Catch A Healthy Habit café. You consulted with me about my lyme and candida issues (skin hives and rashes all over arms). I am very thankful for meeting you, as your knowledge and love for the herbal medicine, as well as the herbs have helped me tremendously. I also felt very strong connection to the herbs, stronger than to any other herbs previously encountered. My condition has greatly improved. I am at the beginning of my monthly flow (cycle), when symptoms are usually the worst, and today I am almost 80% rash free! I would like to be 100% rash free with even more vibrant energy. I am drinking lots of greens, and eating cooked foods as well. I'm staying away from grain, sugar, gluten and dairy. I started taking your ShapeShifter Herbs. I would like to continue to use a bottle or two a month due to the improvements I am having with my symptoms. The improvements I have is improved mobility. I am able to walk further for longer periods of time with the product as compared to without. My feet and hands warm up, my cheeks get a blush of color. I find I am able to stay [awake] all day, no 2 hour naps needed. Mentally I am more alert. I like to take 1 T. in the morning and 1 in the afternoon. "Sea Clear has grown hugely in popularity in our store and has become a staple in many people's diets, including mine. This is probably the number one favorite savory food product in our store for many people!" Healing Thresholds by Rehmannia Dean Thomas is an intriguing book that helps us begin to grasp the essence of profound deep life force health through the art of Taoist tonic herbalism. This book gives a beautiful account for the reader to grasp the general principles and details of this deep level of herbalism. His discussion of yin and yang jing herbs and the energies of chi and shen herbs integrate well with the use of living foods and other more advanced approaches to longevity and optimal well being. Dean has the personality of calmness. His voice is soft, his eyes deep. When he diagnoses, you trust him. His communicaton is soft, well-intended and trustworthy. One is able to feel the heavens and the earth in him! These herbs have been tremendously helpful in giving me increased stamina, energy, libido and strength. Just overall goodness. My digestive symptoms lessen tremendously while I am drinking the second blend. I will do all I can to access the healing modalities/power you offer... I appreciate any time or energy you are able to share! Thanks for the wonderful herb mix you put together for me. While one is never sure what is causal in great improvements, I can certify that the period during which I used your herbs was closely correlated with an improvement in mood and physical confidence. Additionaly, I experienced some emotional growth during the period as well. There was a slight falling off as the herbs lost their potency, followed by a resurgence as we restocked our herb supply with a visit to you. We look forward to meeting with you again. Dear Rehmannia, Shu di, teacher, nagual. The Hsien is incredible, I loved every minute of it. I couldn't put it down but I had to just in order to savour it longer. I am going to read again soon. My main dilema is wanting to give it to everybody to read and never wanting to give up my beloved copy. I resonated with it so strongly, I enjoyed the characters and it really brought me in, I love the sophistication of the knowledge and how it is woven into the story, it is brilliantly intelligent and genius. I love the plot and how the story pans out. I love how much of reality it is and how credible it is and the depth of vision. Incredible! Thank you for your beautiful heart opening generosity. This book moved me deeply and emotionally to a higher vibration, no doubt. It inspired me in a most profound and beautiful way. You're a true soul teacher I am humble by and grateful for you. In gratitude. Heartful blessings. I affirm it. Give Thanx beautiful heart. I first learned about Shaman Shack Herbs when I was at the Longevity Now weekender a couple months ago. Founder, Rehmannia Dean Thomas, is an expert on tonic herbs and has taught David Wolfe all he knows. I went ahead and purchased several of his herbal formulas so I can have the superb experience David Wolfe talks about in his program. There are several different formulas depending on what your needs are. 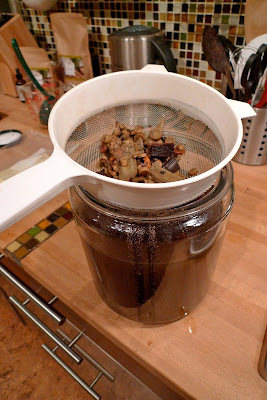 I started off with making the Protection tea which is a mushroom,root mixture of agaricus, reishi, astragalus, cordyceps, scutellaria, goji berries, schizandra and licorice. This mixture had the most beautiful smell, almost chocolate like. Heaven. I had to resist the urge to take a bite, it really was that good. To make the tea, simply soak the herbs in a glass, clay or stainless steel pot with 1 gallon of water for 20 minutes. 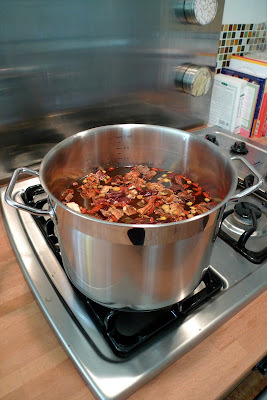 Bring to boil, reduce heat, cover and simmer for 1 hour. Strain tea into a pitcher and save herbs in a separate container. You can reuse the herbs 1-2 more times before discarding. The flavor of the simmered tea is pretty earthy. It's not a bad taste but if you're not a fan of mushrooms this might not be your cup of tea, pun intended. I've been drinking 2-3 cups a day to strengthen my immune system and really don't mind the flavor. Be warned, this not at all like drinking a simple bag of herbal tea. This is intense stuff that is as nurturing to body as much or more than raw foods. David Wolfe uses the teas as a base for making his super smoothies which I have yet to try. The next tea I'm planning to brew is the Cleanse Thyself formula because I will be embarking on the Love Your Liver cleanse this weekend. If you're in LA, Rehmannia is now the herbalist at Euphoria Loves Rawvolution in Santa Monica. There are very few people who have this sort of herbal wisdom so if you are in the area take advantage of the opportunity to speak with someone as knowledgeable as Rehmannia. Today I had the first cup of 3 immortals and I find it truly amazing! I also find it is more "high vibe" than many other tonic teas I have tried before. I just wanted to let your company know that I enjoy purchasing your products that I canactually use. Your company is doing a awesome job and I just wanted to let you guys know. If you would like to add a testimonial please email us at support@shamanshackherbs.com to subject your testimonial!